At Hop Head Farms we use a combination of German equipment and American ingenuity. The Germans have been growing hops and refining harvesting and drying equipment for decades. From cutting the bines in the field to plucking hop flowers cleanly to drying them to perfection – each piece is very important. Our equipment was chosen to work as a full system and it is continually fine tuned depending on the hop variety and conditions for that harvest year. We believe our equipment and our process at every step provides brewers with the highest quality hop pellets for brewing. Here is an overview of our process. Timing – Hops are picked at their peak readiness to reach optimal oil levels. Clean – Newer WOLF Hop Harvesters with an after cleaner plucks the flowers from the bines leaving no stem attached, and almost no leaves or debris make their way into the hop belt. Speed – Fresh hops make their way into vented bins within minutes of the bines being cut from the field for wet hop deliveries. They come out clean and ready to brew with! Efficient – All other hops are carried by conveyor belt directly into the oast towers to be dried. The Hop Head Farms drying system is German engineered and specially designed for our facilities and farm sizes. Batch drying – The system is designed to be continuously refilled as hops pass through the layers. Fresh hops go to the dryer sooner. Clean – Clean heated air is blown up through the beds of hops. No burning gas fumes! Speed- The hops are exposed to heat for less time than traditional American methods. Consistent – Because of the combination of our experience and the technology to set parameters and monitor heat and moisture levels closely, we are able to create consistently dried batches for thousands of pounds of hops. Conditioning – After leaving the oast, Hop Head Farms Hops are conditioned perfectly in specialized vented chambers. Once ready, the hops are baled, and stored in the cooler, ready to be pelleted. 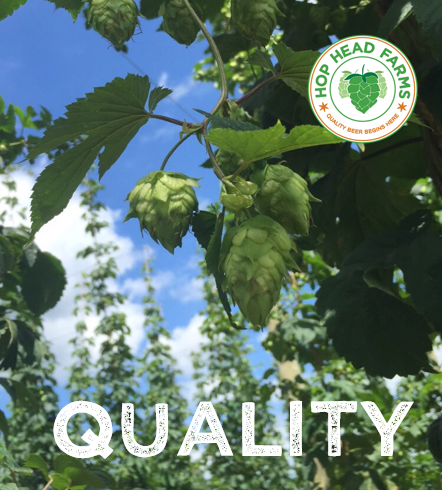 At Hop Head Farms, we aim for perfection. We take pride in delivering the freshest hop pellets with great aroma and high oil content. Tested methods – By working with brewers, we have adjusted our pelleting methods to ensure our product has great utilization and exceeds expectations. Attention to detail – We love hops! We are continually doing quality inspections on the baled material before pelleting and after. Accurate brewing Analysis for every lot – Every lot of pellets is tested and given it’s own analysis posted on the finish label. Brewers need to know exactly what they are getting, not a range of what it might be. Hop Head Farms Type 90 pellets are craft friendly to meet the unique needs of the craft brewer. Strict control of temperature during pellet processing results in a softer pellet that readily disperses into the beer when used in a cold side addition, such as dry hopping. You can feel the difference in the pellets and see the results in your beers. Our standard 11 lb. soft pack is also brewer friendly, and easy to handle. All hop pellets are sealed in nitrogen flushed oxygen barrier bags, then boxed and stored frozen until shipped. Hops are nitrogen sealed in mylar bags that protect them from oxygen and light to ensure highest quality is preserved and prevent oxygen from breaking down the alpha acids. Light and warm temperatures prematurely age the hops. Every package is stored this way until they are shipped to your brewery.